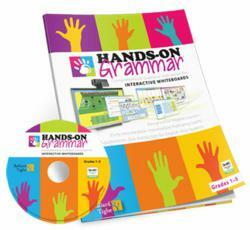 Educational Publisher to Give Free Copies of "Hands-On Grammar"
Ballard & Tighe, Publishers, is giving away Hands-On Grammar, a comprehensive English grammar program for use with interactive whiteboards, to one winning school on May 31, 2012. Odds of winning depend on the number of registered teachers from any one school. Ballard & Tighe, Publishers, is giving away Hands-On Grammar, the company’s new grammar program for use with interactive whiteboards, to one winning school on May 31, 2012. “We’re excited to share a program that brings interactive whiteboards to life and engages students with hands-on, multisensory grammar activities. Hands-On Grammar enables students to touch and move pictures, objects, and text, making grammar fun and enjoyable,” says Mark Espinola, CEO of Ballard & Tighe. Teachers can automatically enter their school when they register online to download a sample of Hands-On Grammar at http://www.Hands-OnGrammar.com/giveaway. Odds of winning depend on the number of registered teachers from any one school. This promotional giveaway applies to schools with interactive whiteboards. Complete rules and details are posted on the web site. Released in January 2012, Hands-On Grammar is appropriate for grades 1 through 5, and provides interactive whiteboard users with grammar activities that cover 15 areas of grammar, such as countable and uncountable nouns, regular and irregular past tense, pronouns, adverbs, conjunctions, modals, possessive nouns, comparatives, superlatives, and others.